Sophia says, go out to play. And the day was full of expectation. When I was a child, I climbed walls, just to see what was on the other side. It didn’t matter how high, your friends were always there with you. You could sit on a wall, throw a ball against a wall, use it as a wall to mark the goal posts. A wall was just a wall, made of brick coloured bricks, brick shaped bricks, bricks that smelled like bricks. Real bricks. Sometimes, you simply sat on the wall, deciding what game to play or where to go next. You told each other jokes and laughed a lot. When I was grown I built lots of walls. Walls made of square pegs in round holes. Walls made of paper shapes. Walls made of expectations. Walls that served no useful purpose until I saw they were made for learning how to climb again. This is my fourth post In response to the 5 day photo/story challenge from suedreamwalker. She has a wonderful blog. Here are the rules for the “Five Photos Five Stories” challenge: “Post a photo each day for five consecutive days and attach a story to the photo. It can be fiction or non-fiction, a poem or a short paragraph and each day nominate another blogger for the challenge. My nomination today is ‘In A Dim Light.’ A wonderful and sensitive blog. This entry was posted in Life, Love and the Universe and tagged climb, expectation, friends, game, play, Sophia, wall. Bookmark the permalink. Yes Virgilio, I like that you add ‘layers of meaning,’ a wall to establish boundaries as well as one to climb over. Love today’s entry Teri, Yes so many walls we build around ourselves and put up against other people.. When we were children, we saw things differently, and we trusted in the wall we sat upon to be just a wall.. Unlike today, so many barriers in disguise .. all with labels upon them. Loved your Blue flamingos, is this your art? Beautifully done.. Yes Sue, when we were children, a wall was just a wall, simple as that. You mention barriers in disguise, how true and how sad that we are so afraid of revealing ourselves and yet, how freeing this can be. 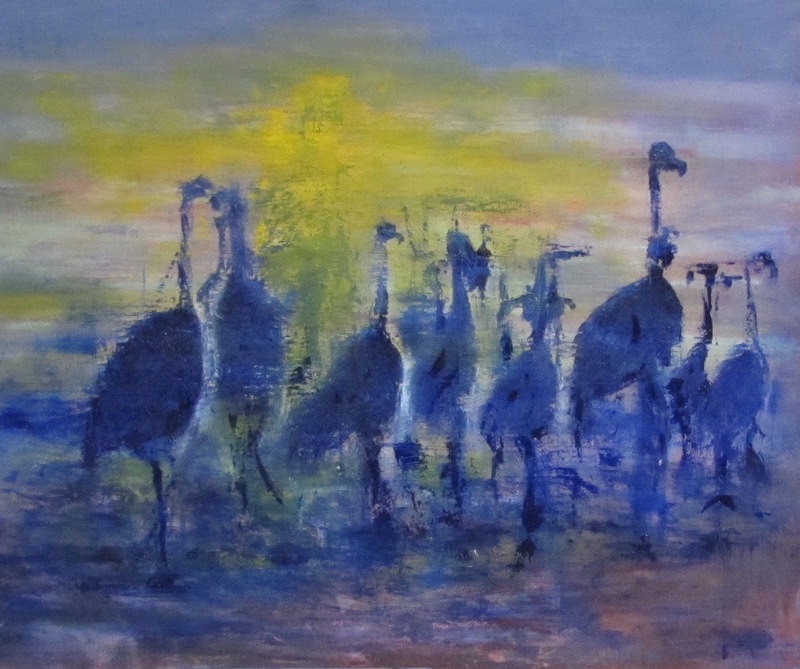 Thank you for liking my Blue Flamingoes, they are my own work, still practicing with oils, and nothing at all to do with walls but the companionship seemed to fit with the childhood theme. Hope you have a good weekend. They are beautiful.. and you are very talented.. I confess to not working with oils much, I enjoy Acrylics and Pastels and watercolour.. But I keep meaning to buy some oils to give them a go..:-) .